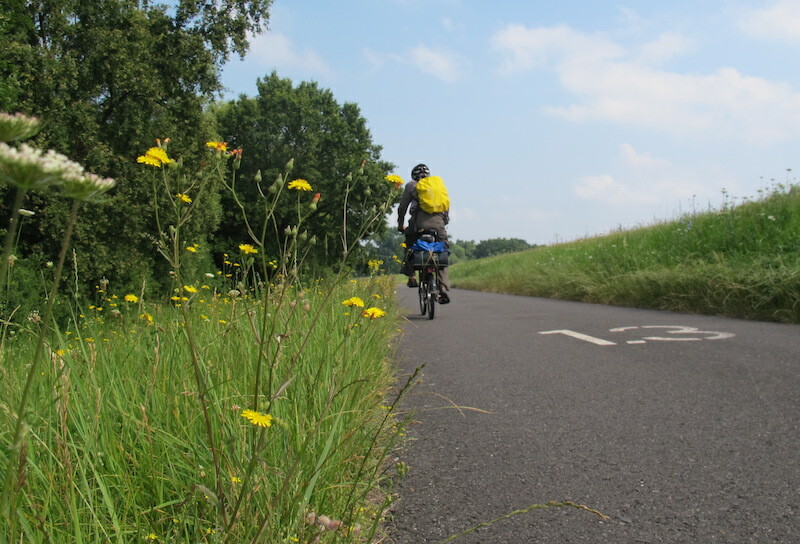 Northern Germany: Guben to Frankfurt (Oder) on the cycle route. Early breakfast at the Onyx Hotel then west across the Neisse River to where the D12 bike track started. I’m glad we did a reconnaissance yesterday as looking for the start this morning would have consumed valuable time. It was a pleasure this morning to ride along the path which we rode yesterday afternoon. Soon after passing by the Plastinarium we struck a section of the path under reconstruction, which included the tearing up of a section of setts. Setts are squared paving stones which sometimes are erroneously called cobblestones. 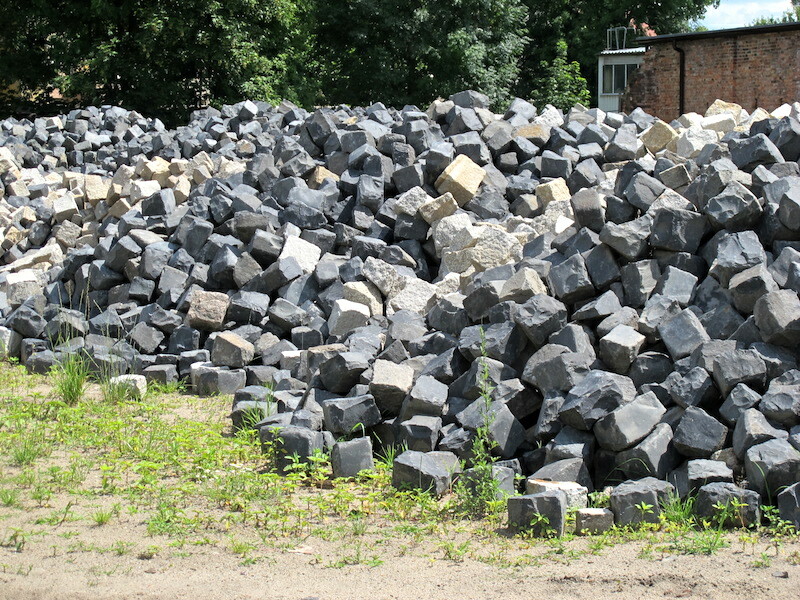 Cobblestones are worn river stones. A beautiful pile of setts. Laying setts in a curved pattern is not just for aesthetics. In this particular case the road was running up hill and if the setts were laid in straight lines the forces applied by accelerating car tyres would loosen them. 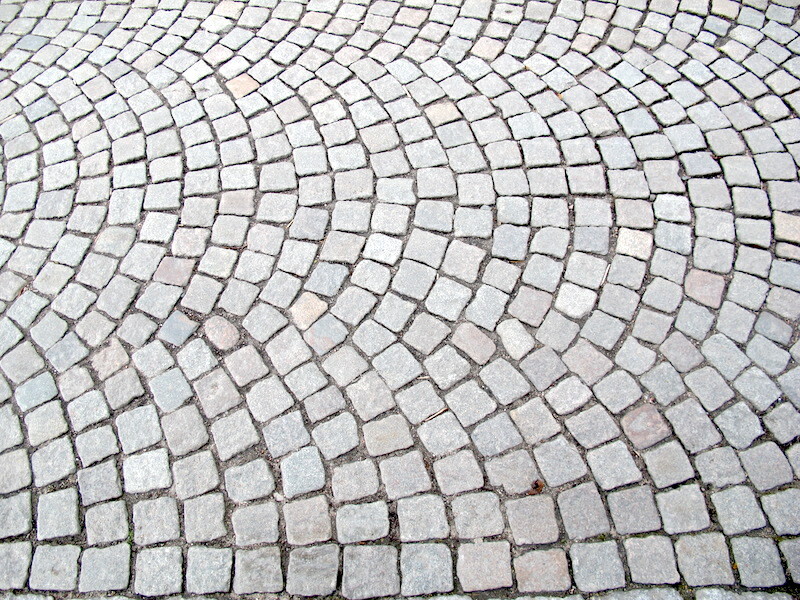 Setts laid in a curve pattern (arch like) push against each other and therefore do not shift their position so easily. Once through the path reconstruction zone it was back onto a good bike path. The path took us through some beautiful forests and because it was early the low sun highlighted the forest under storey. The green hues reminded me of Ireland where it is said there are a hundred shades of green. Early forest hues. It’s impossible to describe the joy of riding through such a beautiful forest and on such a good surface, not sett-like at all. When riding behind Bev, as in the above photograph, I am amazed as to how little luggage we are carrying. Bev has two small panniers on the rear rack and one dry bag on the front, I have one pannier on the rear and one dry bag on the front. Between us we are carrying only twenty kilograms of luggage, not bad for a five week trip. The morning ride took us in and out of forested areas. In between the forests there were villages in slumber, not a soul stirred. 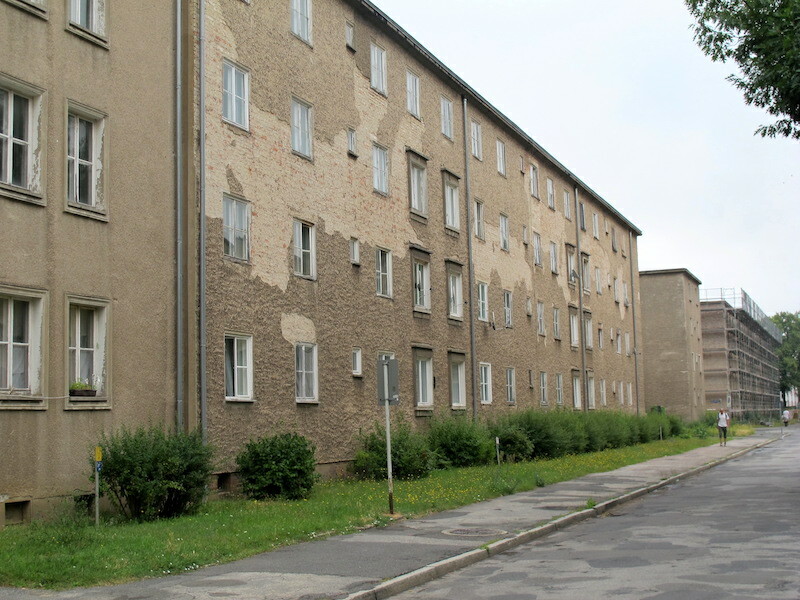 As is the case with many East German villages there are fewer residents because many have gone west to where the work is. However the village houses are well maintained and are used as holiday homes. ‘Go west, young man’ has been the cry for centuries. Americans went west to California, Han Chinese are going to west to Xinjiang region and eastern state Australians are heading to Western Australian mines to seek their fortune. 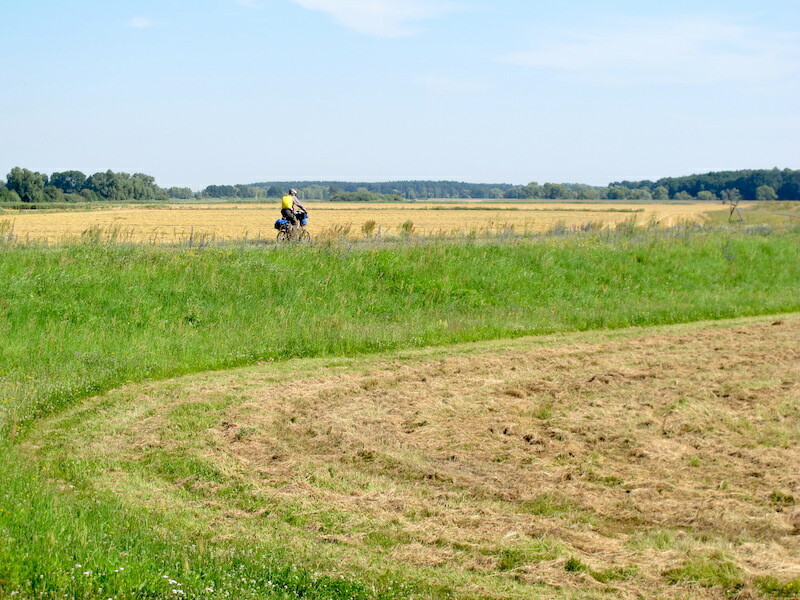 At around morning teatime we moved out of the forested area into cropping lands and again it was great riding. At this time of the year most wheat crops have been stripped and remaining stubble is being baled. Wind-rowed stubble waiting to be baled. 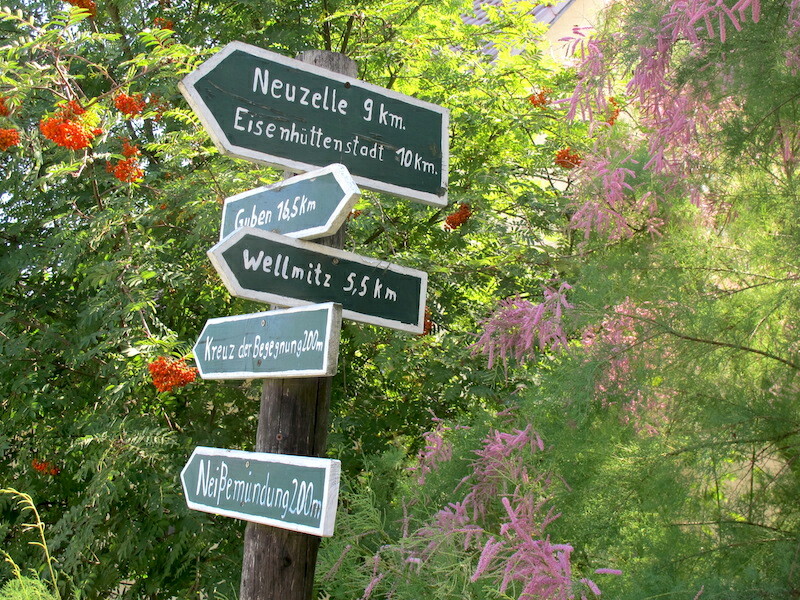 Hand-painted signpost amid the spring flowers. 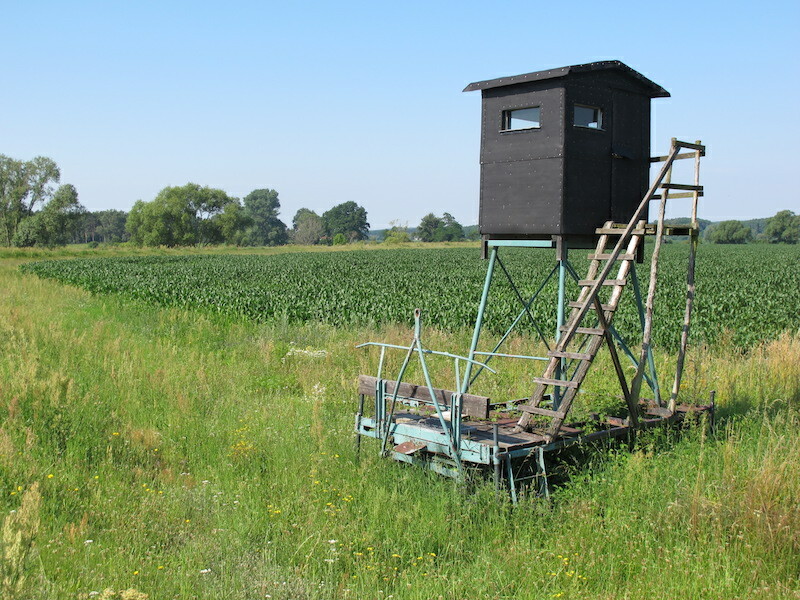 The Oder and Neisse flood plains are quite extensive and there are numerous wetlands and swamps along the edges. Where there are wetlands wild pigs flourish and of course the farmers’ crops are under constant threat of being rooted up. Hides such as the one shown above are set up where shooters sit and wait their quarry. Not only is it an advantage to sit high but the bullets go downwards at an acute angle rather than in a horizontal direction as they would if the shooter knelt down at ground level. The D12 bike path running along the top of the river levee. I suspect the concrete road at lower level was where a border fence once ran. Stream gauging station near the village of Ratzdorf. 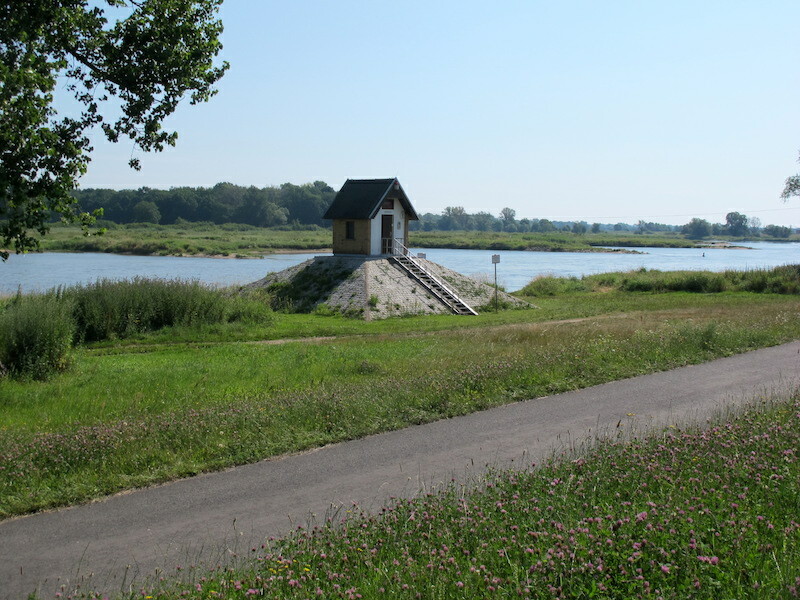 The stream gauging station is located at the point on the Oder River and the Neisse River converge. 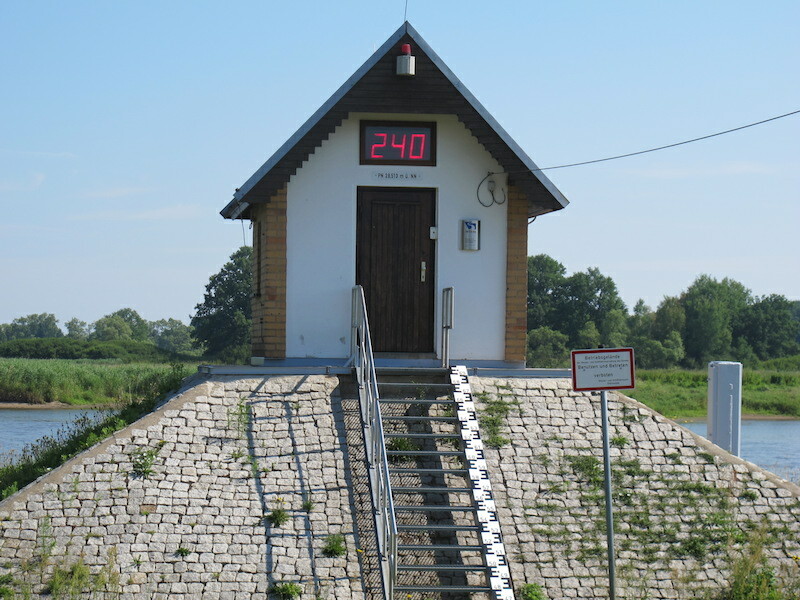 The digital read out indicates the quantity of water, probably cubic metres per second (cusecs), passing by the gauging station. Near the stream gauging station the bike path was blocked with a detour sign. We took heed of the sign and took the detour but in retrospect we shouldn’t have as the detour was had going. I realise now that unless there is a chasm, a missing bridge over a river or a flooded wetland cutting the path, don’t take detours! The detour took us west then north travelling inland through wheat fields, nowhere near the river. At one stage we rode along the edge of what I assumed to be either a wartime or communist occupation time border fence, there were old steel posts sticking out of the concrete path. If only one could turn the clock back just for a minute I think we would see not the tranquillity of today. After the wheatfields the detour took us along some traffic congested roads, not a very pleasant experience as trucks passed at speed, sometimes only a metre away. Eventually we came into the town of Neuzelle and there we decided we would catch the train to Frankfurt (on Oder) further north. At this point I estimated we had ridden around 35 kilometres, which doesn’t sound a lot for the long distance cyclist, but for us it was enough as along the detour section there were long uphill stretches and I guessed the temperature to be around 34 degrees. At Neuzelle station Bev consulted the railway timetable and a train was due out at 1.13 so we rested on the platform and waited patiently. At 1.35 the train had not arrived so we asked a couple of iPhone-equipped teenagers to consult their phone and find out why the train was late. They informed us there were no trains running to day because of track work back towards Guben. 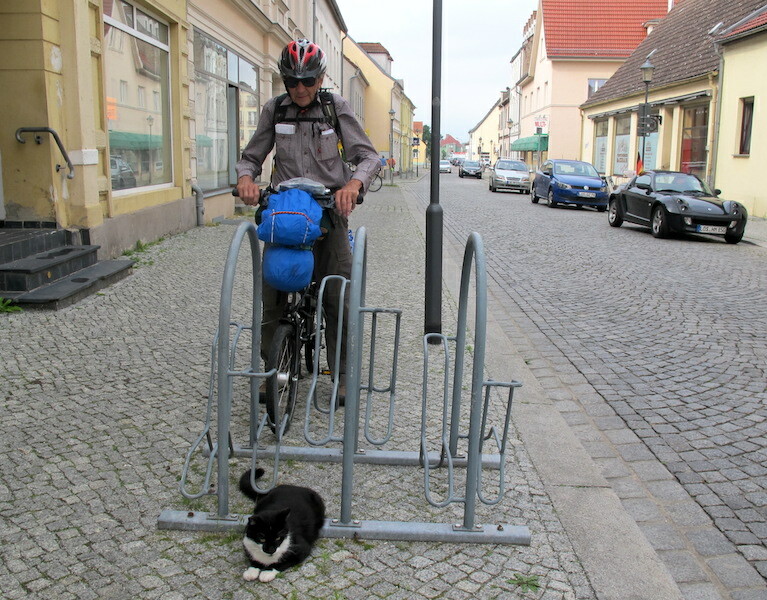 The only alternative was to mount our steeds once again and continue riding to the next town, Eisenhuttenstadt. This business of no train and a detour that turned into a major re-route without warnings is not very German-like but, as west Germans keep telling us, when things don’t go as planned you have to remember you are in East Germany. At Eisenhuttenstadt over a late lunch we decided to stay the night. Tourist info directed us to a hotel and a pension and after a little searching we found both. It turned out the hotel and the pension, were the same place even thought they had different street numbers. Pension Balkan. We were more than happy to arrive after a long, hot difficult afternoon. When we first arrived in Eisenhuttenstadt we thought it a boring drab town and in some ways it was. Boxy buildings with no architectural flare lined all roads and back streets, however after exploring the town and getting to know its history it became far from boring. The town was founded in 1950 and was called Stalinstadt. It was established next to a new steel mill and the mill and town at the time was hailed as a socialist role model. Main street and steel mill. 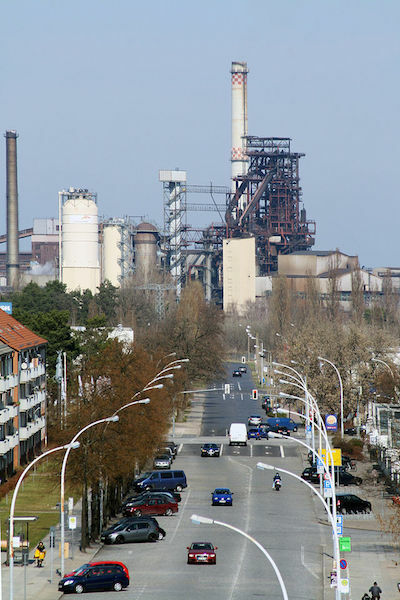 Photo: Eisenhuttenstadt Weg zum Hochofen 2012 via Wikipedia. The local tourist information blurb states that Hutte experienced a little shakeup in December 2011 when actor Tom Hanks visited the town whilst filming in Germany. A disguised Hanks took a private tour of the town and after returning to the US he spoke with talk show host David Letterman and told an audience of eight million people about his impressions of the town he called ‘Iron Hut City’. Iron Hut City socialist-style apartment blocks. There are abandoned apartment blocks in and around the town which gives the town a depressed look, but the depression is not reflected in the attitudes of the locals as everyone we spoke to and dealt with were enthusiastic about their town. The buildings are also being renovated for modern apartment living. 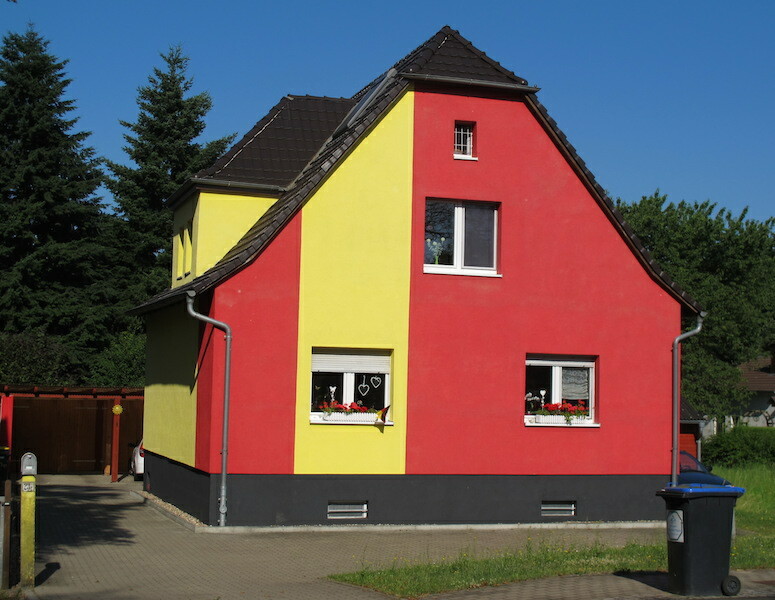 A local quoted not so long ago that Eisenhuttenstadt represents more than any other place in the old East Germany the complexities of dealing with the past. 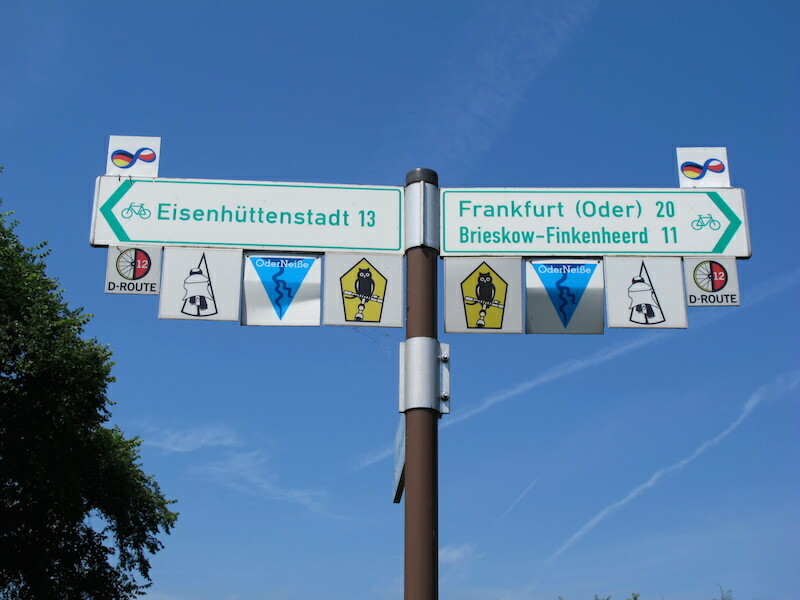 Tomorrow we head for Frankfurt (on Oder) and according to the girl at the tourist information we will have no trouble in finding our way along the bike path as it is well marked. 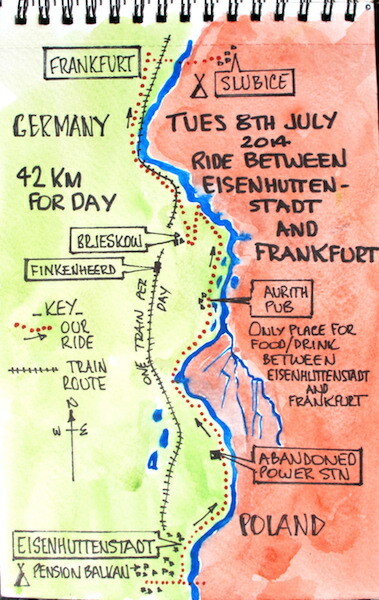 The decision to ride to Frankfurt wasn’t made until this morning as we needed to consult the weather forecast. Last night severe thunderstorms were predicted for today and we can well do without getting drenched. Some might say we are getting old and this might be the case but we have spent our share of time soaked to the skin over the years so we don’t go looking for it now. With the weather on my mind I looked to the sky and smelt the air. I decided it was unlikely there would be rain of any significance so we set out to the old part of town where the bike trail to Frankfurt began. 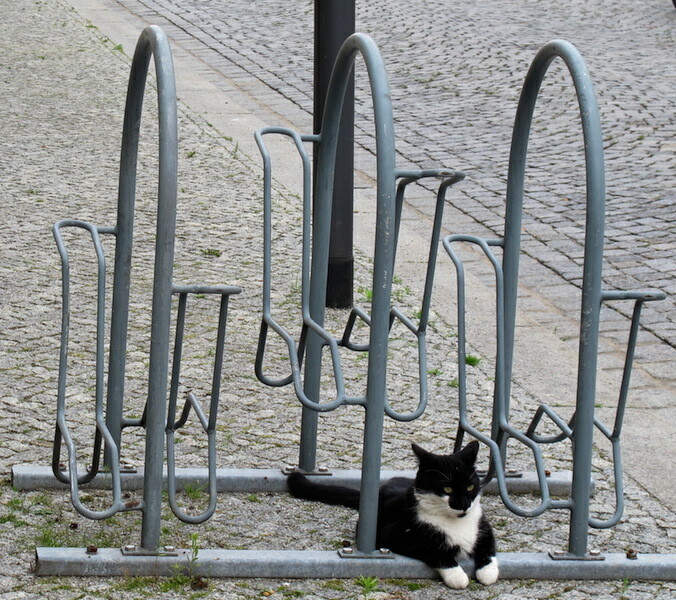 Guardian of the bike rack in Eisenhuttenstadt old town. Everybody who passed by this moggy gave him a pat. Cats are smart because they sit with protection all around if they can to make it difficult for predators to sneak up on them. In Britain the term ‘moggy’ refers to a kitten or cat. In other countries it refers to a cat of mixed breeds. The advice we were given yesterday about how easy it was to find the beginning of the bike path turned out to be not quiet true. The problem is the bike path signs are not big enough, they are less than 100mm square and from a distance they are indistinguishable when mixed with other signs. A colourful sign at the start of the D12 bike path. My interpretation of the signs: the D12 cycle route; the rider with cape means all weather path; the blue triangle… the path follows the river; the owl…the path goes through nature lands; the figure 8 sign on top…I have no idea. Leaving the old town we headed along a path we thought was the bike path but it turned into a cobblestone track which didn’t seem right so we did a ‘u’ turn and headed back. Along the way we met a German couple who were also lost. 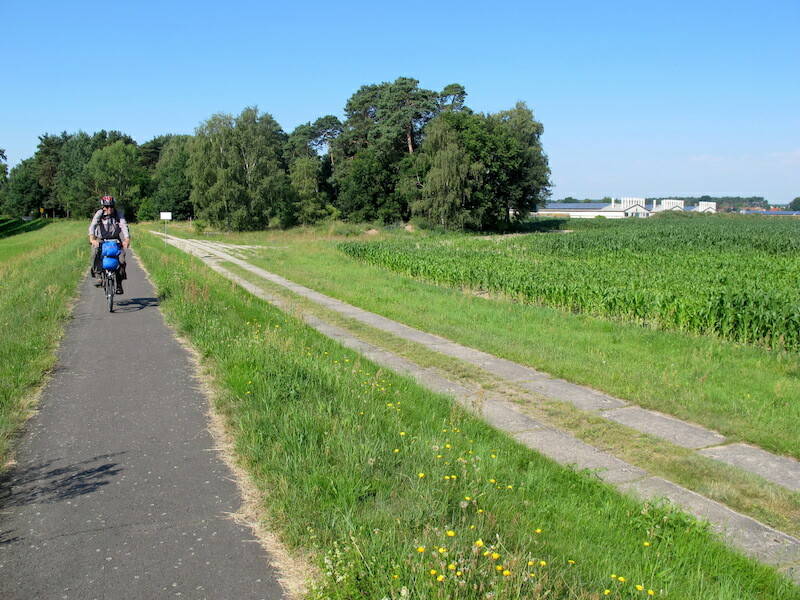 Between the four of us and with the help of a local we finally found the start of the D12 bicycle path. 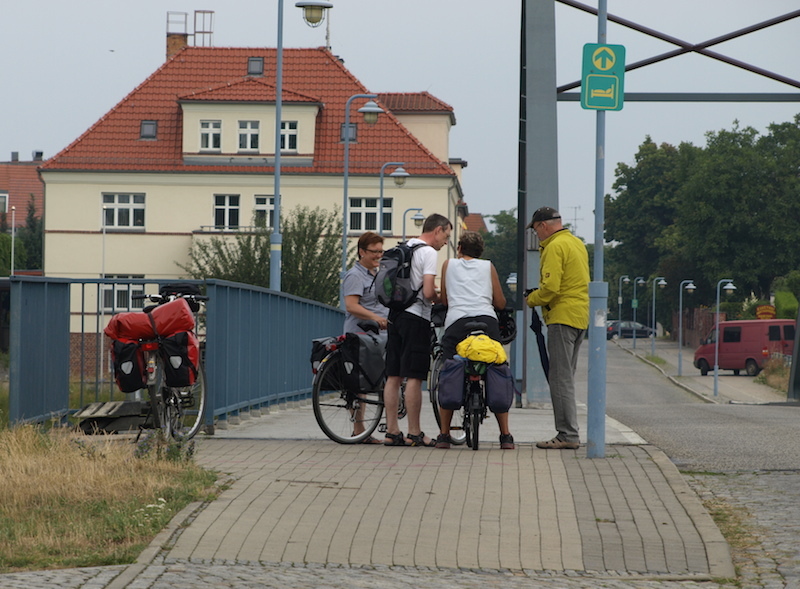 Bev, the German couple and a local discussing where the start of the bike path to Frankfurt (Oder) might be. The reason for ‘(Oder)’ is there are two Frankfurts: one on the Oder River and the other on the Main River in West Germany. In our travels so far we have met Germans, Dutch and French cyclists but no Australians. 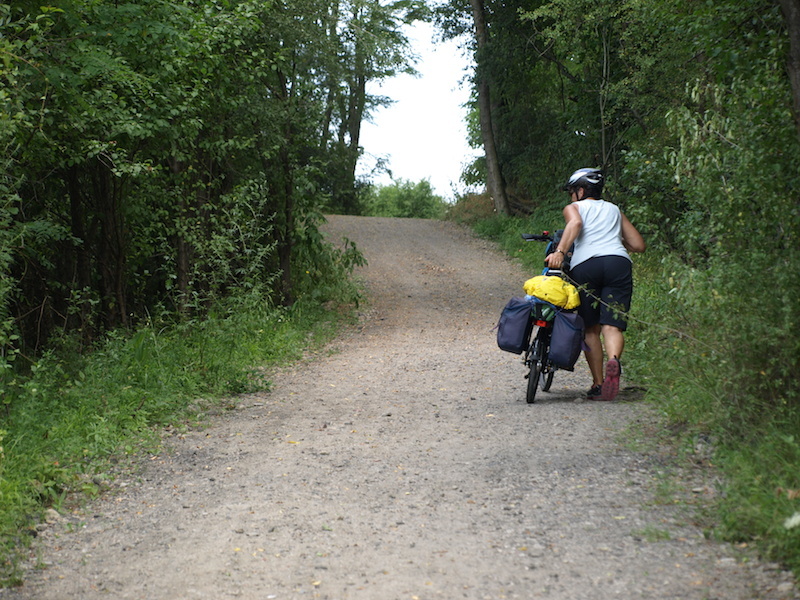 Early stages of the bike path to Frankfurt (Oder). It was a great ride today, 90% of it was along a sealed bike path, not like yesterday at all. There was one section today that took a bit of negotiation around a bridge construction site. There was a very steep uphill push and we guessed it was a 25% grade near the top. Slogging up the 25% grade. Today’s ride along the river was not all nature and wetlands. There were a number of abandoned buildings and I speculated as to what their history might have been. There was one that required no speculation, it was a power station. At some stage of its life I think its huge smoke stacks were subject to some serious artillery bombardment. Unfortunately we couldn’t gain access to the ruin as it was surrounded by a water-filled moat and high fences. I found out later that the power station was never finished. 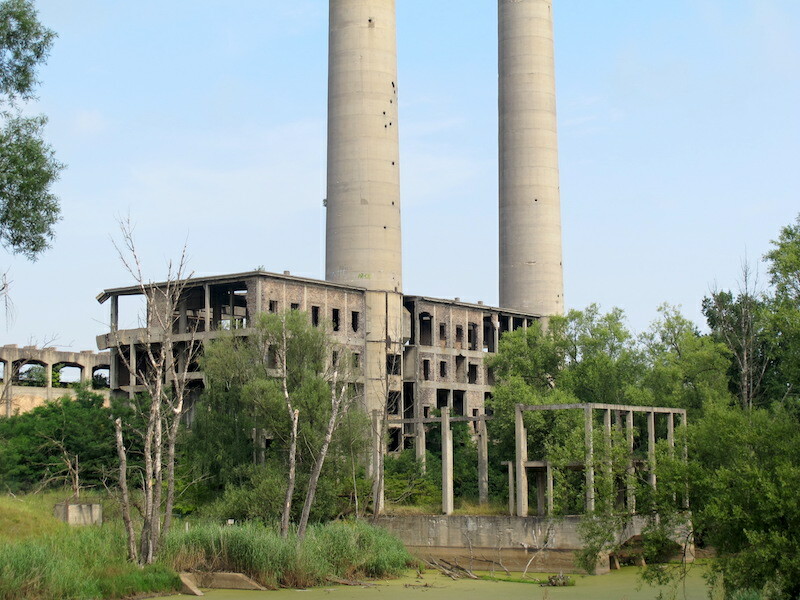 Abandoned power station. Ruins like this are just the sort of places I like to get into and look about. 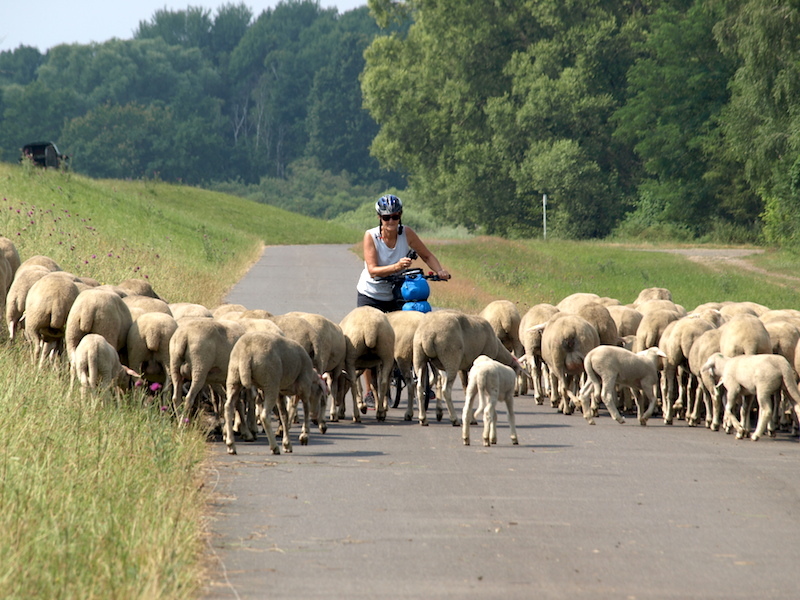 Bev pushing again, this time through a mob of Border Leicester cross sheep. Shepherds and cyclists have one thing in common: time to think. It was around 3.00pm when we arrived at Frankfurt and our first stop was the tourist information where we sought accommodation directions. One of the girls directed us across the river into Poland. I also asked her if the bike path we rode today from the south extended further north. Her reply was she didn’t know. Overall we covered about 43 kilometres today, which I think is as much as we have done so far in one day. We are slow compared to other riders because we take to sidetracks and look about and if there is a kiosk we stop to buy something and have a chat. Bev says we are slower because our wheels are smaller compared to a conventional full size bike. 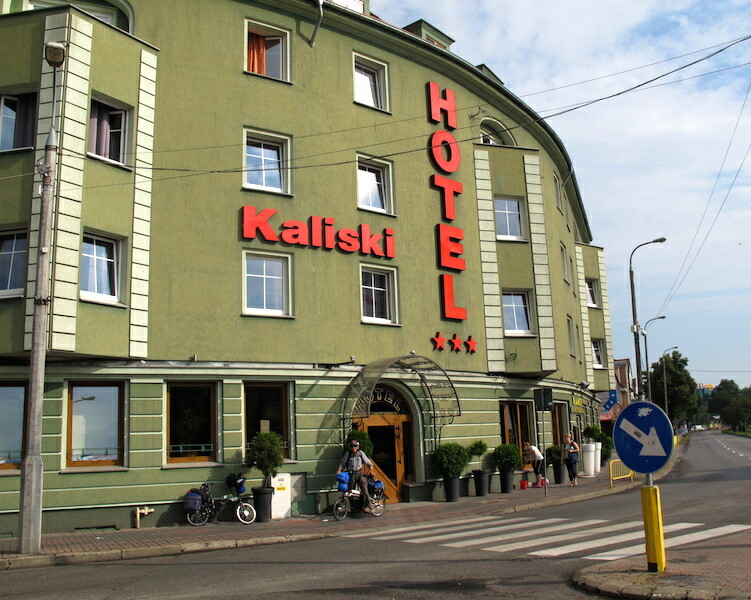 Tonight we are at the Hotel Kaliski in the town of Slubice on the Polish side of the river. It is a bit of a flash place but not being able to find less flash I suppose we will have to wear the luxury for the night. This afternoon a big storm broke, I’m glad we were not camped out in the wetlands of the Oder. 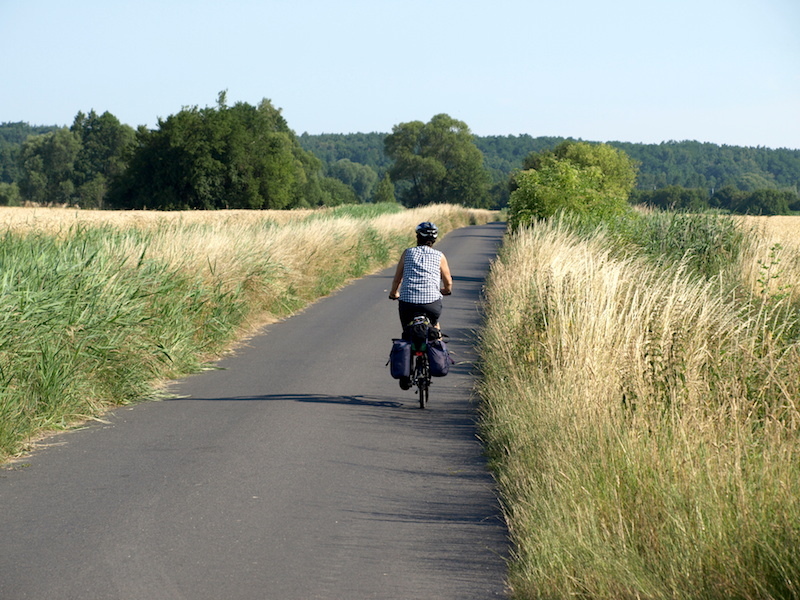 Due to time constraints we have decided not to ride to the Baltic Sea, the choice was the Baltic Sea or Berlin. Berlin won out so tomorrow we turn west and head for Berlin. Another post has come to an end and we hope you have found it interesting and informative. 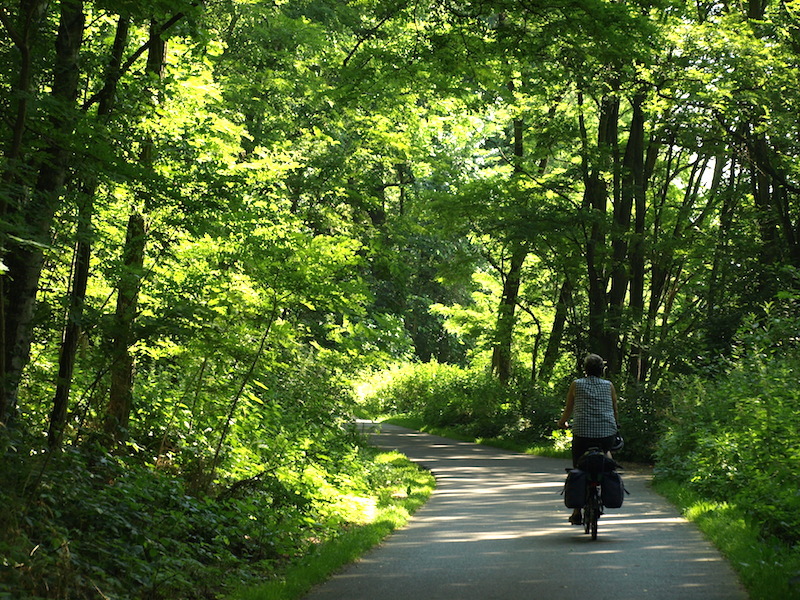 My favourite photograph in this post is Forest hues, riding the bike path through the forest was a magic moment. Bev’s favourite is the shepherd thinking. The next post relates to Berlin. 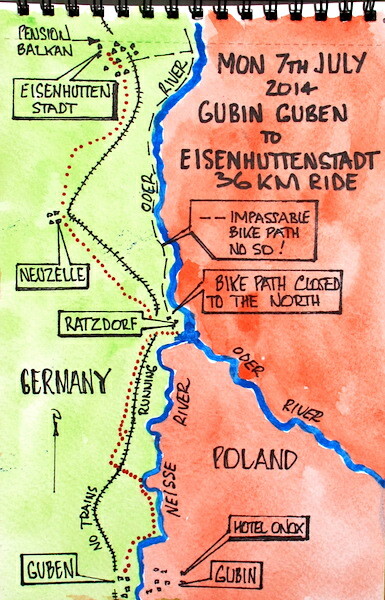 2 Responses to Northern Germany: Guben to Frankfurt (Oder) on the cycle route. Getting close to ‘pumpkin time’ but determined to get through another 1 or 2 before midnight. T Bear found living at Sunday market in Bentleigh Victoria will send to Thursday Island.